Resident Evil Corporate Battles REMAKE :: Information :: Characters: B.O.W. 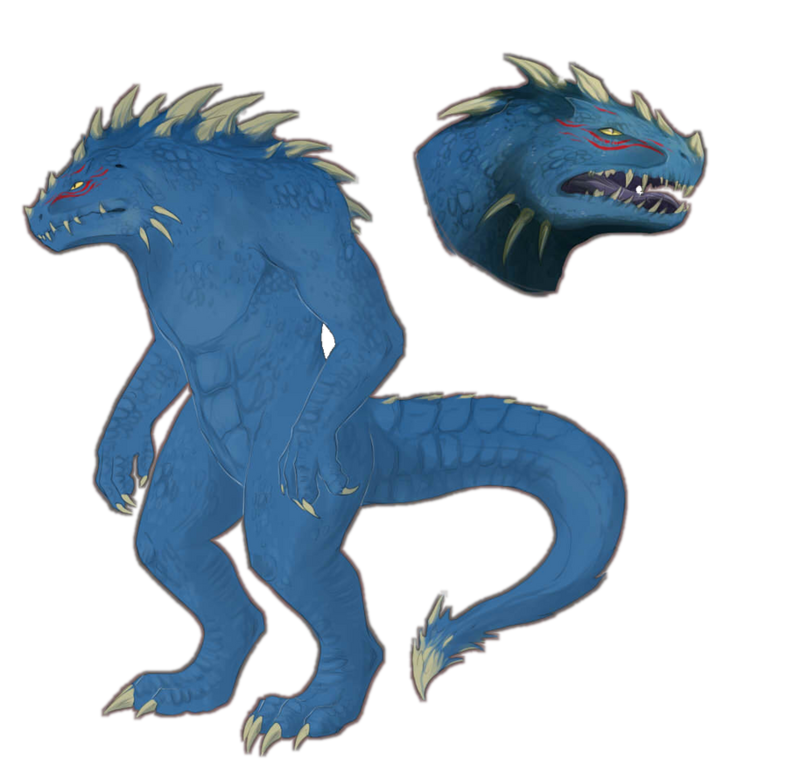 Body/Physical Appearance: Appears like a larger MA-121 Hunter Alpha, but the scales colors are a deep blue and it appears more reptilian like, retaining its lizard like head and its tail. Massive spikes now protrude from the creature’s back and at the end of the creature’s tail. Red asymmetric tattoos were painted into the flesh under his eyes from Dr. Hinako’s eccentrics. Weapons: His size, smarts, sense of smell, sight, claws and voracity. Items/Equipment: Control Implant: A small silver probe which protrudes from the back of his skull. Like the Hunter ‘Sweeper’ Series, it helps relays commands to the creature and provides the creature with information. At current, Beta registers Dr. Makoto Hinako as his ‘handler’ and is safe from his attacks. BETA, also sometimes called ‘Blue’ by his creator, Dr. Makoto Hinako, is a unique side experiment done by the Japanese Umbrella Scientist. His appearance is more lizard like due to the concentration of Blue & Marine Iguana DNA. His mutations resulted in becoming a larger, more lizard like being, that stands about as tall as a Tyrant series monster. To combat his elevated aggression and cunning, a ‘Control Implant’ was surgically installed into his brain. Like the Sweeper, he can visually see what a security picks up if he is tapped into it because of this implant, its also what keeps the good Doctor, and those not listed by her as enemies safe from his untempered aggression. Wide Jawline- Allows for a greater bite radius, and has rows of sharp back facing teeth. Enhanced Sight and Smell- He can flick his tongue, similar to snakes and other lizards, to taste the air and track his prey. This is due to his lizard like qualities. His sight is also enhanced, allowing him to see moving targets and has a wider view due to the placement of his eyes. Sharp Claws and Teeth: He has sharp claws and teeth, like most Hunters. His tail is also bladed thanks to the bony shards which protrude down the length of his back and ball up around the tip of his tail. Prehensile Tail- His tail is quite manipulative, with the ability to grasp, pull, yank, slap, swing and stab with the bony barbs embedded into it.